As a kid birds fascinated me. To be able to fly anywhere at anytime. Since I couldn’t be bird, I wanted to be a pilot, yeah, and me afraid of heights. My little brother joined the Air Force after one year of junior college and was trained as an electronics technician – he worked on communications and crypto gear. For a while he was stationed at Vandenberg Air Force Base on the California coast. While there he built and flew a hang glider – he wasn’t afraid of heights. A couple of years after dad died I moved mom back to where she grew up and most of her family still lived. I flew home. What a rush – the take-off was a blast. Everything was fine until we got up near cruising altitude. The view was fascinating but the thought of being seven miles in the air was not. The next time I flew was in a single engine four seater owned by a tile contractor friend of mine. He needed to move his plane from one SoCal airport to another and invited me along. This was neat. We never got above twenty-five hundred feet and I had a great time. I’ve flown many times since and gotten used to being so high that I can barely identify anything on the ground, but I still like small planes that fly at low altitude. As a kid I had a dog and an aquarium full of guppies and tetras but never any birds. Now I have two lovebirds; their names are Bird One and Bird Two and, no, I can’t tell them apart. 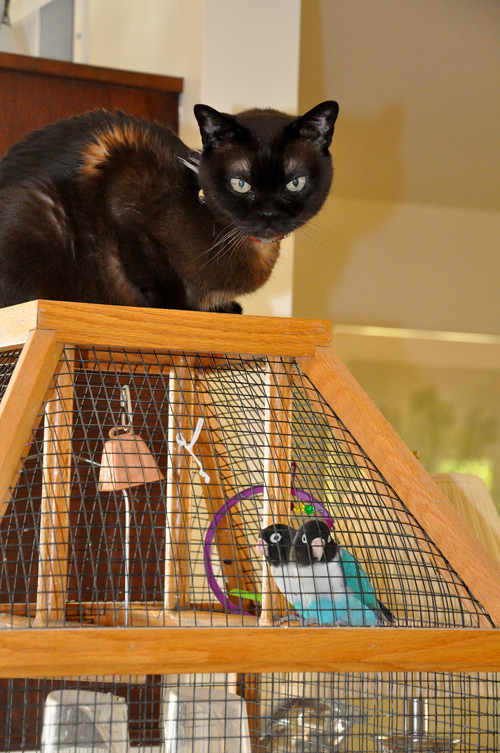 Merlin likes to sit atop their cage and dangle his tail in front of them. They climb and try to bite his tail, but, to date, they haven’t succeeded. 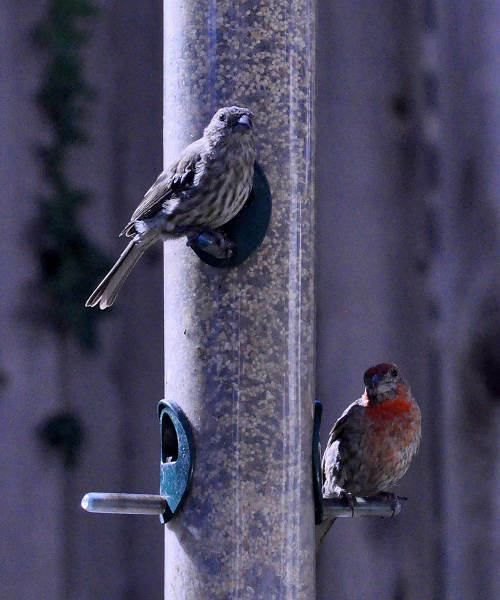 front and back yards, many finches, sparrows, doves and others. I also, only half jokingly, tell people that we feed hawks. We can tell when there is a hawk around as the birds disappear or go still. 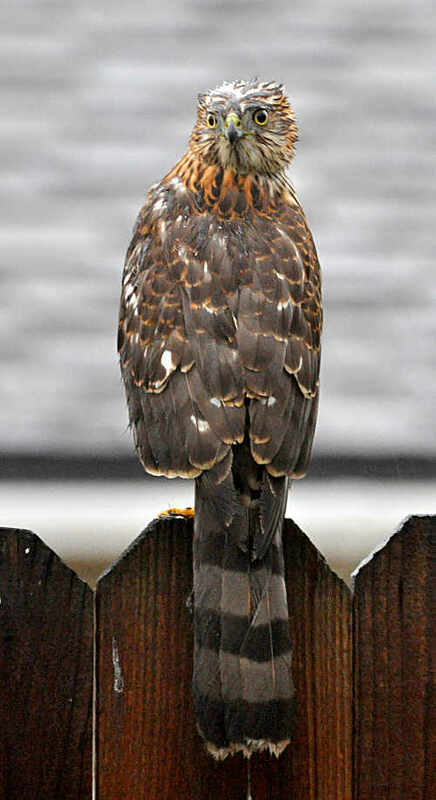 Occasionally “our” hawk perches on our fence and looks for prey. He, or she, also dines in our yard. One afternoon my wife and I were on our patio and the hawk flew into one of our rosebushes to flush a sparrow hiding there. Half a minute later he had the sparrow on a neighbor’s chimney top and was dining. We’ve also seen him hunt unsuccessfully. Occasionally, we find feathery evidence of his presence and success (and also that of the neighborhood cats). Although I’ll never fly like one, I still find them fascinating.